Pilates Avatar Directly on Your Smartphone! Today we’re announcing a major update to Pilates Avatar! We started Pilates Avatar to empower you to become more independent with your practice. And while we built something you could download onto your smartphone and take with you, we knew we could make the mobile experience more streamlined. Starting today, you'll be taken to an upgraded experience optimized for mobile devices, where you can access all your workouts without having to download, sync, or mess with iTunes. Just log into pilatesavatar.com on your smartphone’s web browser then tap on the circular user icon in the upper right corner of your screen. After you enter your username and password, you’ll be taken to your Workouts page where you’ll see all your workouts listed. Tap on the workout you want and be taken to that Workout page where you’ll be able to play the audio file immediately without having to download anything. 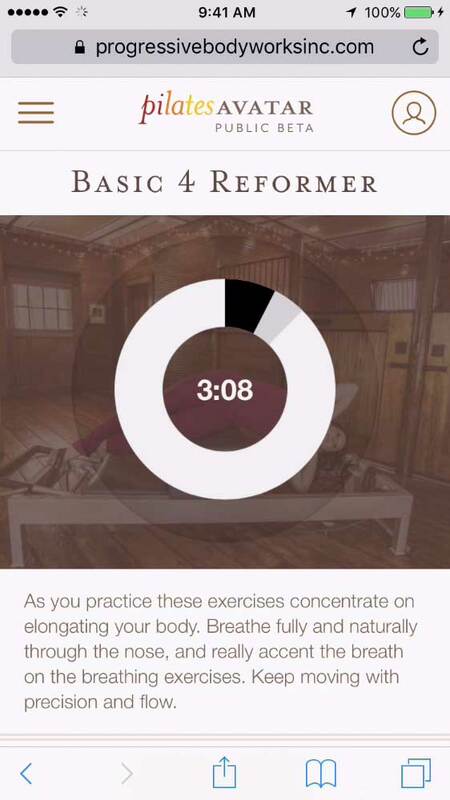 Scroll down to see the exercises listed with a play button for each video snap. At the very bottom of the page we kept a pdf of the exercise list in case you prefer that format. Another great feature for playing the audio is the rewind/fast forward function which is as simple as a finger swipe around the inner circle. We are excited about these new improvements making your Pilates Avatar experience much more streamlined and easy!